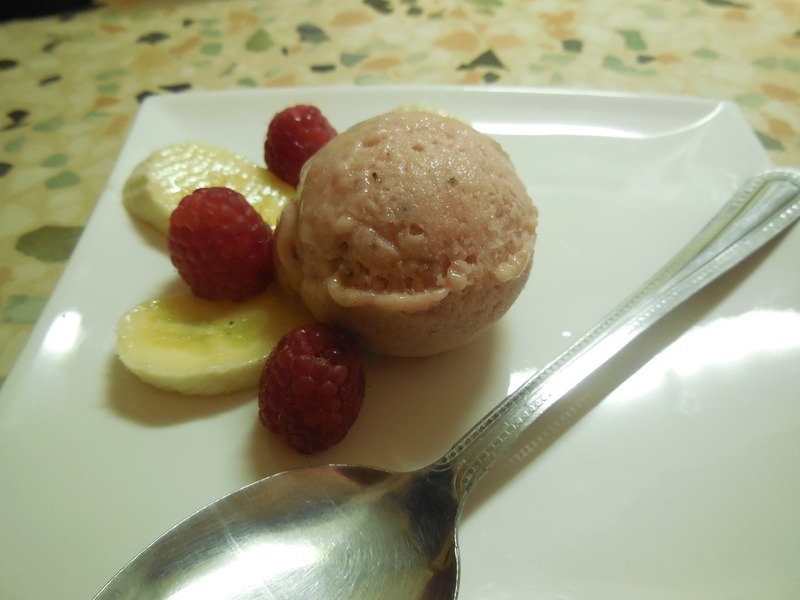 And now for something healthy…..my very own Suzy sorbet! It is prepared without processed sugar or egg whites; in fact, the recipe is simply created from just pure fruit and I have to say it’s delicious. This week I really struggled to come up with a name for my dish (since it has the fruit taste of sorbet with the creamy texture of ice-cream). In the end, I opted for sorbet because it does not have any dairy in it. If you are wondering how this recipe can taste so delicious, I would say that you would have to try it for yourself! Everyone I have made this for really likes it. It is great for children and adults alike. If you don’t like bananas on their own it’s a great way of hiding them in food and of course, it will count towards your 5 a day! 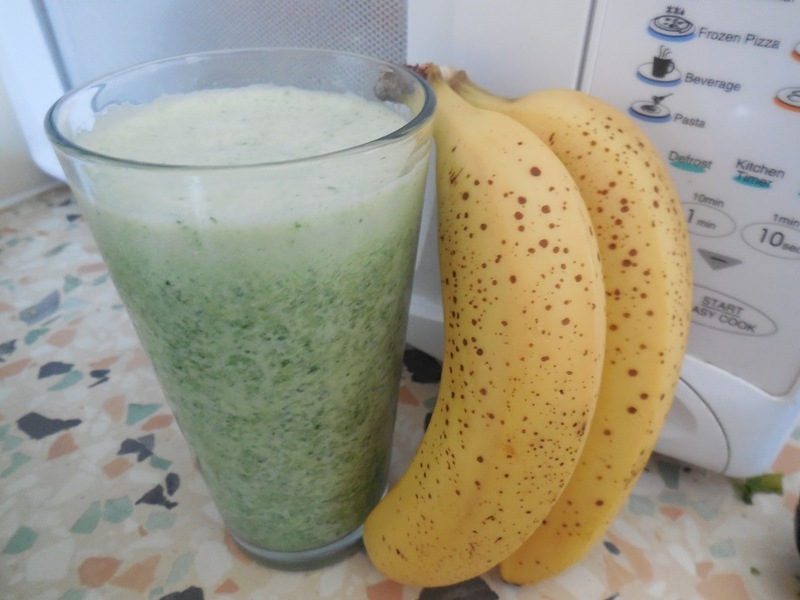 All that this recipe requires is 4 medium bananas, one other type of juicy fruit and a food processor (you may need some orange juice to add in as well). I have tried this recipe with raspberries, mangos, pineapples, apricots, blueberries and kiwis- my advice is to be experimental! I usually decide on the fruit when I go and see what is on offer at the supermarket which helps to make it as cheap as possible if you are on a budget. Cover a baking tray with cling film. I use a 20cm x 30cm tray. Chop up the bananas into small chunks and place on the baking tray. Wash the raspberries and place them in the food processor and blend. Place a sieve over a big measuring jug. Pour the raspberries into the sieve and use a spatula to push through as much juice as possible. You should have at least 100 ml of juice. If it is more that is even better. Rinse the bits out of food processor. You will need to use this again. Add the frozen bananas and the raspberry juice to the food processor. Blend until smooth, soft and creamy. The blending could take a while and you may need to move/shake the processor around to make sure all the banana bits are blended properly. If the mixture is still a little stiff, here is where you can add a dash of orange juice. Normally, I would use half a tub of raspberries for this recipe but on this occasion, it didn’t produce enough juice so I used the whole tub. Whatever fruit you are using, it will taste amazing and look lovely and colourful. I hope to try this recipe with apples one day but if anyone gets there first, please let me know how it turns out. For now at least raspberries are still my favourite.